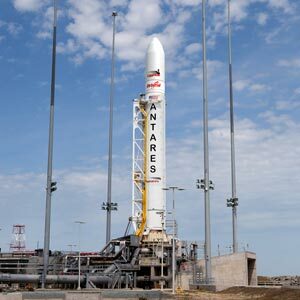 Orbital’s Antares rocket is just about ready for its first demonstration flight (Credits: Orbital Sciences Corp). On February 13, Orbital Sciences Corp had to abort an Antares hot fire test, the last test standing in the way of a demonstration flight of the Cygnus cargo ship to the International Space Station. 1.5 seconds before ignition, the onboard computer cutoff in response to a low pressure reading in a nitrogen purge tank. By the following day, Orbital had traced the problem to a valve that did not open as intended. The problem is expected to be resolved quickly, and a new test date has been set for February 21. The demonstration mission to ISS should still take place in April as previously scheduled. Orbital might be facing a challenging year however, as reflected in a a teleconference company executives held with investors on February 14 to discuss 2012 fourth quarter earnings. CEO and President David W. Thompson indicated that delays in the Antares COTS and CRS programs has contributed to reduction of revenue margin on the project: “The company experienced frustrating delays in completing the Antares launch site and in conducting main rocket engine testing, which combined to push back the first flights of our new launcher into 2013,” said Thompson. This situation may be resolved in the long term, since Orbital receives 25% of its payments for COTS and CRS only after deliveries are made, but it leaves the company falling short for a 6-10 month period in 2013. “This first quarter or in the early part of the second quarter we expect to hit the point of maximum negative cash flow, cumulative cash flow on the CRS contract,” said Thompson. It also looks like Orbital may not achieve the 10% profit rate it anticipated on the CRS program, settling for a lower 6% rate roughly similar to margins on simpler satellite products. The cumulative effect of these numbers has some investors asking when Orbital could renegotiate its contract with NASA, even before it has begun fulfilling the current one. Thompson indicated that discussions might begin in 2014 on the next contract, but the question itself might be a warning sign of the financial risks that could endanger an infrastructure that relies on commercial partners to perform NASA services in orbit. What happens when those partners discover that the challenging and exacting business of launching cargo to ISS may not be worth the investment? Of course, Orbital has not reached such a juncture and may not; space operations are notorious for their deep startup costs. But as we move into an age when more and more space operations fall into the private realm, profitability may well become a risk factor to consider, particularly when the sole customer has financial woes of its own. The once more looming threat of sequestration by the US legislature could have serious consequences for NASA’s commercial programs, and its partners are already planning for the crunch. However, it could be worse: Thompson noted that NASA’s budget isn’t looking all that bad compared to its other government customer, the Department of Defense.